A fresh satellite for Russia's Glonass navigation network launched aboard a modernized Soyuz rocket Sunday (Oct. 2) on the first flight of the workhorse booster since a mishap doomed a mission in August. The Soyuz 2-1b rocket lifted off at 2015 GMT (4:15 p.m. EDT) Sunday from the Plesetsk Cosmodrome in northern Russia. Launch occurred at 12:15 a.m. Moscow time. The Fregat stage deployed the 3,119-pound Glonass M spacecraft at 2347 GMT (7:47 p.m. EDT), and ground controllers communicated with the satellite to verify it was in good health, according to ISS Reshetnev, the craft's prime contractor. "The spacecraft launch went off according to plan," Reshetnev said in a statement. "Thus far, Glonass M's mechanical subsystems have been deployed. The satellite is Earth-oriented and functioning properly." Roscosmos, the Russian space agency, said Sunday's launch restored the Glonass satellite fleet to full capability for the first time since 1996. 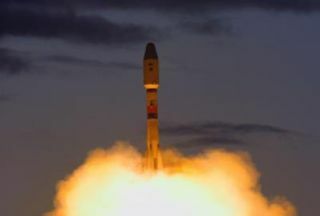 The satellite launched Sunday is the 24th member of the Glonass constellation, giving the system reach throughout the world. Russia initiated a satellite replenishment program to mend the fragmented fleet after a funding crisis in the 1990s. Although the Glonass launch was the first Soyuz flight since the Aug. 24 failure with a Progress space station resupply ship , Sunday's mission used an upgraded version of the launcher with a new upper stage engine. Engineers blamed the August anomaly on a defect in the Soyuz third stage's RD-0110 engine, but that engine won't fly again until a mission scheduled for Oct. 30. If that flight goes well, manned flights of the Soyuz will resume in November. Four more Glonass satellites are due for launch before the end of this year. Three will fly together on a single Proton rocket launch in November, then another will ride to orbit on another Soyuz rocket.